I don't know of any nickname for this LRI so I'm calling it a ball-shaped LRI for now. 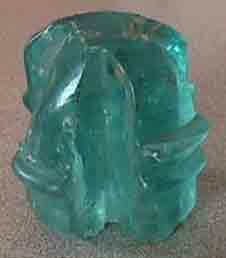 This particular piece sold for about $500 on June 24, 2001 on eBay. It is embossed "PAT. APPLIED FOR." The seller listed it for a neighbor who bought it at an auction in Marshallton, Iowa. Until this piece came along, no one knew what the bracket looked like. About 6 (now 7) of these are known. They come in both embossed and unembossed versions. 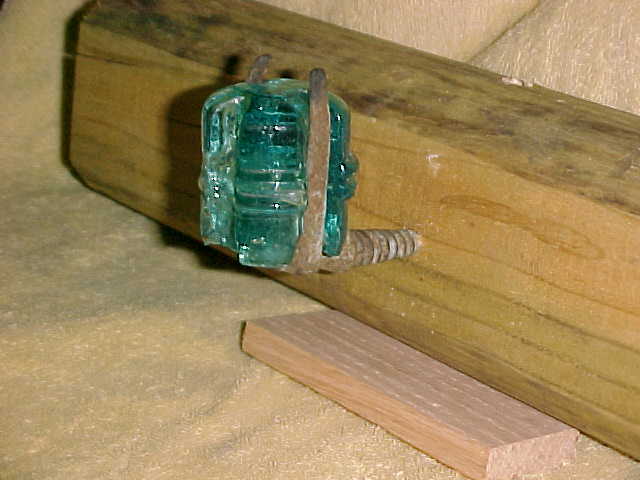 Steve Bobb's display at the 1996 Long Beach, California national contained this insulator. He did the same display at the November 1996 London, Ohio show. 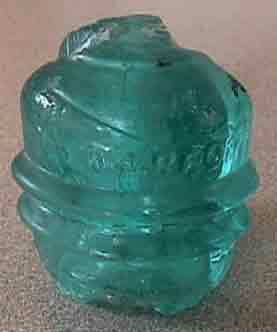 Steve owned both versions for a while and says they came from a Camden, New Jersey privy vintage 1870-1880. To date, the patent on the piece has not been found. Thanks to Steve Bobb for his information on this. The LRI to the left and below was sold on eBay on March 11, 2007 for $212.59. The price probably would have been even more since one bidder reported that a glitch in his auction sniping software kept him from placing a higher bid than this. There were 11 bids by 6 bidders on the piece. Jack Riesselman (katfish) was the seller and indicated that "this is the first time I've seen this item." 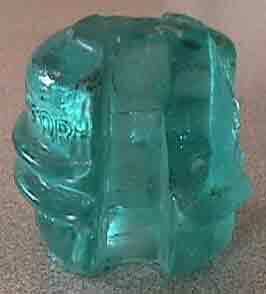 The description of the item was listed as follows: "It is embossed on the front dome Pat Appl For. On the other 3 sides there are 1/2 in deep groove, segmentations, that are very pronounced. As you can see in the series of photo's there are some chips and slices. 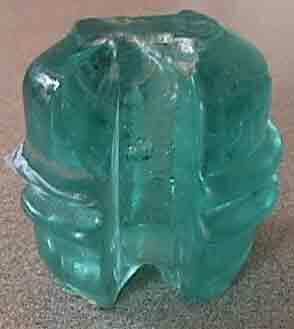 It is about 2 inches tall and similar in width."